I’ve been living in the Rockies and helping home owners buy and sell Summit County real estate for a long time now, but I still think we’ve got some of the most gorgeous communities around. Our neighborhoods have a lot of distinctive features that set them apart. From mountain views to incredible architecture, our Summit County neighborhoods offer a wide variety of homes for every taste and style. With so many appealing communities, it’s difficult to pick just one to feature each month! In this week’s blog I want to introduce you to a wonderful neighborhood called Blue Rock Springs. It is a subdivision near Breckenridge and a truly beautiful community. Located in the Blue River area, Blue Rock Springs is about 2 miles south of Breckenridge with 54 residential lots that are mostly used for unique single family homes. The subdivision itself has a very natural feel with dirt roads, preserved forest with both pine and spruce trees, and a feeling of being close to town without being in town. But on the upside, you don’t have to worry about being stranded in the winter either. All the roads in and out are plowed regularly and travel is rarely a problem. Like the trees that surround and offer a privacy between the homes, the topography has been preserved with natural contours on the lots, some of which slope down to wetlands and natural habitat where waterfowl and other wildlife congregate. It’s a lovely area to see natural wonders up close. 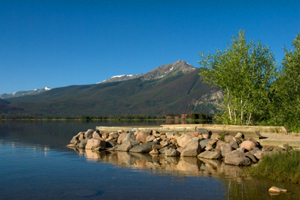 Plus, Blue Rock Springs is not far from all of the great things Breckenridge has to offer. That means you’re free to take advantage of all the unique shops and restaurants in downtown Breckenridge whenever you’re in the mood. If you’re looking for a mountain neighborhood that provides privacy, scenic views and access to one of the most popular towns in Summit County, Blue Rock Springs could be the perfect place to call home. Want More Info on Blue Rock Springs? As you can tell, the Blue Rock Springs neighborhood has plenty of fantastic qualities to offer its residents. If you’d like to check out this community in person, let me know and I can schedule a visit at your convenience. Also, if you want to view other Summit County homes for sale, I’m happy to put together a custom list of properties for you. Feel free to browse through the updated listings on my website to get started and when you’re ready to talk through your options or schedule showings, contact me at any time via email ([email protected]) or on my office line. I look forward to working with you!